The outer edge of the disc and the center perforation is framed by a thin flat raised border. The overall polish of the piece is smooth and matte, with some evidence of prolonged burial. 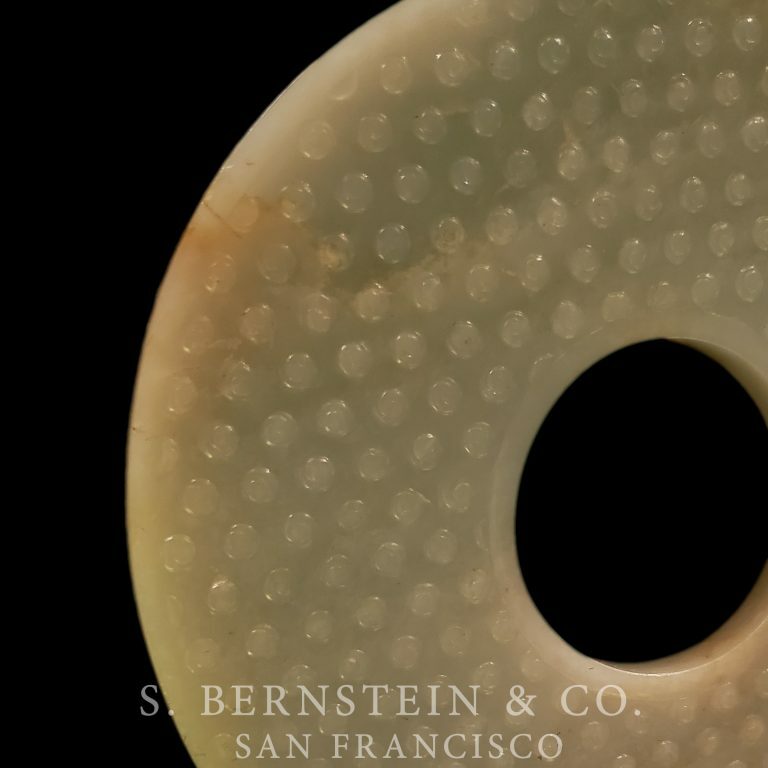 In our opinion, the proportions of hole to outer edge, flattened borders, and characteristic spiral forms on the surface make this jade bi disc an excellent example of Han Dynasty workmanship. 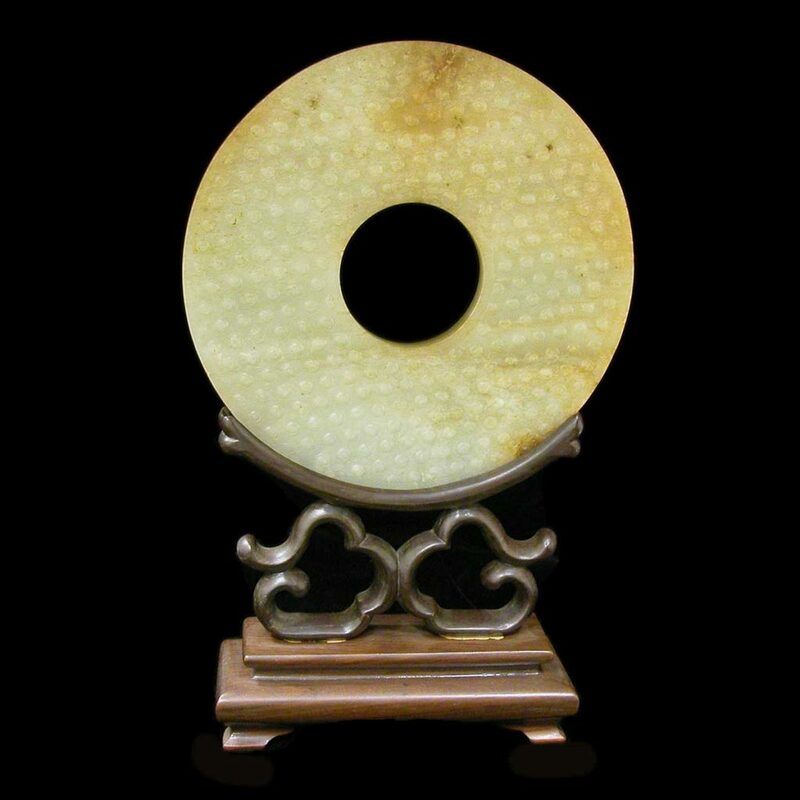 For an overview on bi discs during the period see Chinese Jade From the Neolithic to the Qing. Jessica Rawson. London: British Museum Press, 1995. Pages 246-251. For a discussion of the sprouting grain pattern see Chinese Jades From the Collection of the Seattle Art Museum. James C.Y. Watt. Seattle: Seattle Art Museum, 1989. Page 45. A sword pommel with similar raised comma pattern is illustrated in detail, plate 24. For further discussion of grain patterns seen on bi discs see Jade of The East. Geoffrey Wills. New York: Weatherhill/Orientations, 1972. Page 81. A bi disc, dated of similar size and proportion and with similar raised patterns is illustrated in Chinese Jade Carving. Dr. Ip Yee. Hong Kong: Urban Council and Hong Kong Museum of Art, 1983. Page 116, plate 102.